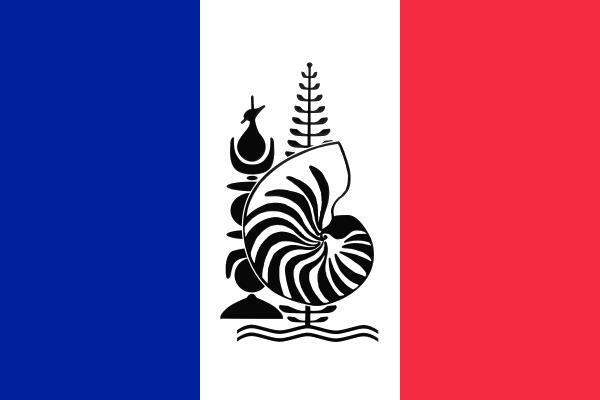 New Caledonia enjoys a special within France's overseas territories, enjoying far more autonomy than France's other territories. The island group is located in the South Pacific, off the north east coast of Australia. The name of the territory, New Caledonia, came from the islands "discoverer," Captain Scott, of Britain. It is alleged that the island reminded him of the coast line of Scotland, the land of his fathers birth. So, he named the land "New Caledonia" in honour of Scotland. In French, the name is Nouvelle Caledonie. However, the islands most recent constitution does allow for a new flag, motto, anthem, and name should there be a consensus. Whilst the islands where first sighted by Captain Cook in 1774, none of the major European powers laid claim to the islands until France did in in 1853. This was part of Napoleons attempts to build an empire in the south Pacific to rival that of Britain, who already had Australia, and New Zealand. Over the following decades, the native population was nearly wiped out, thanks to disease brought in by the Europeans, and the immigrant population being swollen with France shipping out thousands of prisoners, in a programme copying that of Britain, with their forced deportation of criminals to Australia. During WWII, the islands became hugely important to the Allied cause. The islands sided with the Free French forces, and where helped by the Australians to resist attacks by the Japanese. Later, the US built up significant forces on the island, including military bases. Including a large pentagonal building which would later serve as the HQ for the newly formed Secretariat of the Pacific Community. However, after the war, a slow campaign was begun to agitate for independence, building up until the 1980's, when the campaign became far more high profile. Culminating in 1988 with a bloody hostage taking in Ouvea. This unrest led to a series of accords, first in 1988, then again in 1998. These accords afforded the islands a huge degree of autonomy, gave the inhabitants local citizenship, a co-national flag, its own emblem, and a slow process leading to more autonomy. The end of all this will be a referendum between 2014 to 2019 when the islands status will either be settled as an autonomous French territory, or as a fully independent nation. The emblem of the islands consists of a nautilus shell, in black, placed in the foreground. 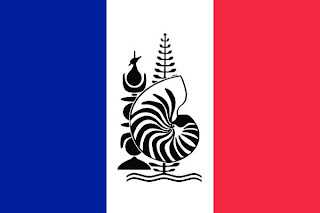 Placed behind the shell is a "Fleche Faitiere" as well as a representation of a tree native to the islands, as well as a pair of wavy lines underneath to represent the wave surrounding the islands. It is common to see this symbol defacing the French tricolore. In 1980, the FNKS party instituted its flag which would enter widespread use, and was formally adopted by the local government, and finally in 2010 formally became adopted as a co-official flag. To be flown alongside the French flag. There was a lot of controversy over this flag, given it came from a political party. Rather than finding something new and apolitical. The flag itself features three horizontal stripes of blue, red, and green. The blue stands for the sky, and the sea round the islands. The red represents the blood of the local Kanaks who have fought to maintain their culture, and the green represents the land. And the ancestors buried within. Placed in the centre, and offset to the hoist of the flag is a gold disc, edged in black. The disc represents the sun, and the black symbol placed upon it is a representation of a "Fleche Faitiere" a type of arrow which adorns the roofs of many homes, speared through a series of local shells. Before the formal adopting of this flag, to represent the islands, the sports community adopted its own flag. A vertical tricolore of grey, red, and grey. It features a representation of the Olympic rings, and in the centre features a silhouette of a native bird. It will be interesting to see what happens. Once 2014 rolls round, the Territorial Congress gains the ability to call a referendum on the islands status at a time of its choosing. Be it to continue as a French territory, or as an independent nation.